Lucy is a dog who was rescued from the streets of Puerto Rico after being paralyzed in a car accident. 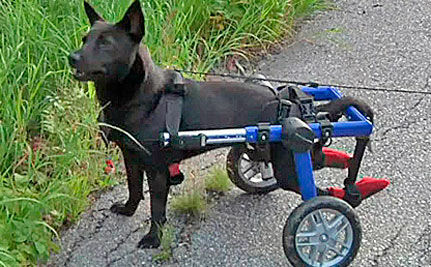 She received a Walkin' Wheels dog wheelchair and has learned to get around very well. Her new owners decided to test out her determination and endurance by attempting a walk up New Hampshire's Mount Washington -- the tallest peak in the northeastern United States. In the video, you'll see scenes from the walk made by Lucy and her canine and human friends.